In the past, cooking in iron barrel or oven was difficult and costly, since cutting off the trees and using them as firewood was harmful to the environment and ignition needed a long time and emitted smoke that made use thereof difficult indoors. Moreover, the use of unhealthy tools in cooking makes it difficult to clean them, which reflected negatively on the cleanliness of food and human health in the long run. On the other hand, cooking using electrical appliances is safer and less expensive. This is what distinguishes Mandi Electric Barrel as it provides the user with a clean, healthy and easy cooking experience. Using stainless steel for the exterior and interior structure of the device, as well as lightweight insulating materials to preserve the interior temperature has made the device lighter, making it easier to carry and move from one place to another inside the house or outside, such as a nearby house, rest house or any place where electrical power is available; its benefits are multiple and not confined to one place. 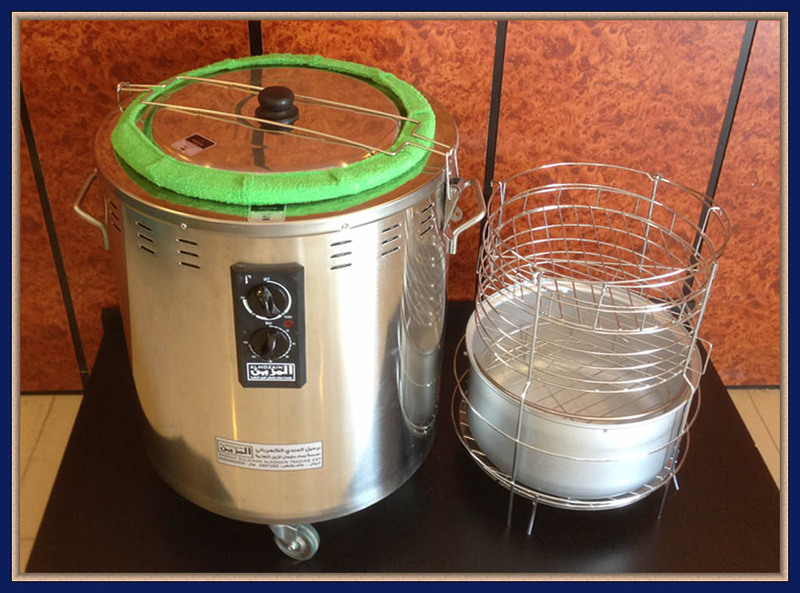 Further, the use of stainless steel for the interior structure of the device makes it easy to clean and able to be washed off with soap and water for removal of stuck fats and blots like household wares, which constantly provides the user with a clean cooking experience and healthy food and reflect so on the human health. Before use, any packaging plastics, papers or plastic materials inside the device or attached to the basket or its legs must be removed before use. The device must be turned on for about 30 minutes only before the first time of use, leaving the device working on the temperature of 280 °C without the lid until it is out of the vapors resulting from, and also for the purpose of practical test that the device has no manufacturing defect and is ready for use at any time. Some vapors may come out from the side vents and keyboard during the first operation. This is normal and will end with the time to test the device before use. If you want to cook meat or chicken without rice, you should put the pot in its place in the basket with the addition of a very small amount of water. The use of the basket without the pot causes damage to the heater and so out of warranty. There is attached to the basket a grid of small stands to be placed inside the pot to give extra storey on which vegetables like potatoes can be put to be grilled. Vapor-suppress fabric must be significantly wetted with water. Do not use it when it is dry so as not to be damaged or burnt. If the side locks are not tightly locked after the installation of the tight-lid handle, you can manage it by forcing the parallel bars in the tight-lid handle and decreasing the distance between them till they become like inward-opposite brackets to be tightly locked. It is preferable to calculate the time of keeping food inside the device using the personal watch, to avoid any error occurring from moving the timer, emergent malfunction or tampering. For the taste of Mandi, it is preferable to get parts of the chicken outside the basket so that fat drops down during cooking and result in Mandi taste. This also applies to meat by getting some of the fatty parts of meat out of the basket. The device cannot be operated by electric-power transformers used on the car battery since they cannot operate devices that rely on thermal heating even if they are of 6000-watts capacity, as reported by the specialists. Electric generators can operate it, taking into account the proper voltage for the device. Do not tamper the wiring of the device, such as changing the triple plug in the device wire to binary plug, since it includes the fuse of cutting off power in the event of any short circuit. Tampering like such may cause fire or burn all its parts, such as the heater, keys and interior supplies, and so be out of warranty. You can use high-voltage connections if the plug is binary or distant from the place of use, but it should be of three entrances to fit the plug of the device and bear more than 3,000 watts. Use it carefully. - Keeping the cooking pot clean reflects positively on food hygiene and human health. - Unpleasant odors inside the cooking pot indicate a lack of cleanliness. - Rotten and old fats and food leavings in the cooking pot interacts with heat and evaporate and return to the cooked food inside the pot, affecting its taste, smell and cleanliness, which will negatively reflect on the human health. - One of the most important merits of the Mandi Electric Barrel is that it is easy to clean. This is due to the interior structure made ​​of stainless steel which makes its cleaning easy and convenient constantly. - It is preferable to clean the barrel from the inside using a liquid dish-cleaner with a sponge. - Wash the inside of the barrel with water gradually until the soap disappears completely. - Discharge water from the barrel cautiously for the barrel not to slip. Lift up the bottom of the barrel making its top down and vice versa. Repeat this many times until the soap disappears completely. - It is preferable to leave the barrel dry after being washed. You can turn it on after five minutes. - Cooking Basket must be cleaned immediately after use so as not to be difficult to clean. - Fabric used to suppress the vapor (Vapor-suppressing Fabric) must be kept clean through washing it regularly with soap and water after use. - Wash the meat and then put it in the basket. Leave it till water discharges and then put it in a big dish. - Sprinkle salt on the meat pieces by piece until it reaches all parts. - Make the recipe of spicing the meat. Add turmeric to the mixed spices, and mix them with appropriate amount of yoghurt. Then, spice the meat piece by piece reaches all parts. You can add a teaspoon of salt Chinese salt on the spicing to soften the meat. - You can replace the spicing by sprinkling mixed spices, turmeric and saffron color to the meat. - Wash the rice only (not to soak it), and place it in the colander until water discharge from it. - It is preferred to use another small bowl if the required amount of rice is few. Put rice in the main bowl of the barrel to protect it from direct heat. You can add a little amount of water inside the big bowl to ease the rice from sticking more. - Make the recipe of rice. It contains a proper quantity of onions, oil, spices, turmeric, salt, and habhar (as desired). You can add magi. - After sauté frying the onion, sauce and a quantity of tomatoes can be added as desired. - Add normal non-boiled water, taking into account the appropriate amount to the amount of rice (for each cup of rice, cup and a quarter of water). But if meat quantity is small, then cup and a half of water for each cup of rice. Stir the rice in the pot. You can add red or green pepper as desired. - If you do not want to cook rice, the rice pot must be put in its place so that liquids do not fall on the heater and damage it. - Put the chair, having the bottom-installed iron sheet protecting the rice, in its place inside the barrel before you turn it on. - If the barrel is clean, you can use it immediately without heating. But if it has some light oils from earlier use, then turn it on for 10 minutes by putting the heat switch on 280 °C and the timer on 10 minutes, taking into account that the barrel be covered by the lid only without vapor-suppressing fabric. - Remove the lid and put it aside. Then cautiously put the rice pot down in its place over its chair. - Put down the main basket inside the main barrel before putting the meat pieces, so as to carry and put it easily inside, taking into account not to put it over the heater and be broken. - Put the meat pieces in the basket on two storeys. You can use only one storey if one storey is enough. Preferably, put the ribs and light pieces in the grid immediately next to the pot and put the pieces such as the hip and shoulder in the upper moving grid. - Bring the vapor-suppressing fabric and spice it immensely with water. Then wrap the lid with it and lock the barrel with the lid using the tight-locking handle. - Put the switch on 180 °C. - If the quantity of meat is 1-3kg, put the timer on 85 minutes. - If the quantity of meat is 4-6 kg, put the timer on 100 minutes. - If the quantity of meat is 7-8 kg, put the timer on 110 minutes. - If the quantity of meat is 9-10 kg, put the timer on 120 minutes. - Over time, we will see vapor going out through the lid. This is normal. As well, the indicator light will turn on and off according to the heat degree. - After the end of the time adjusted, the device will automatically turn off. Leave the lid locked tightly for 20 minutes. - Unlock the lid and remove it cautiously until vapors come out gradually. - Use of anti-heat glove to carefully lift the basket. Then, remove the pot from its place at the bottom of the barrel. - Note that the upper storey is fried more than the lower storey. If you want to fry the two storeys together, return the basket inside the barrel again after taking out the installed one and turn on the device for 10-15 minutes. - Then serve the food evenly on two medium-sized dishes. You can scatter nuts, raisins, hard-boiled eggs, sliced ​​tomatoes, lemon and green pepper as desired. - Wash the chicken and then put it in the basket. Leave it till water discharges. - Put the chicken in a large bowl and sprinkle it with salt bit by bit until it reaches all of its parts. - Make the recipe of spicing the chicken. Add turmeric to the mixed spices, and mix them with appropriate amount of tomato sauce and little water until they become one mixture. Then, spice chickens in it one by one. - You can replace the spicing by sprinkling mixed spices and turmeric to the chicken. - Add normal non-boiled water, taking into account the appropriate amount to the amount of rice (for each cup of rice, cup and a quarter of water). But if chicken quantity is small, then cup and a half of water for each cup of rice. Stir the rice in the pot. You can add red or green pepper as desired. - Put down the main basket inside the main barrel before putting the chickens, so as to carry and put it easily inside, taking into account not to put it over the heater and be broken. - Put the chickens in the basket on two storeys. You can use only one storey if one storey is enough. - If the quantity of chicken is 1-2, put the timer on 60 minutes (one hour). - If the quantity of chicken is 3-4, put the timer on 80 minutes. - If the quantity of chicken is 5-6, put the timer on 90 minutes. - If the quantity of chicken is 7-8, put the timer on 100 minutes. - If the quantity of chicken is 9-10, put the timer on 120 minutes. - After the end of the time adjusted, the device will automatically turn off. Leave the lid locked tightly for 10 minutes.